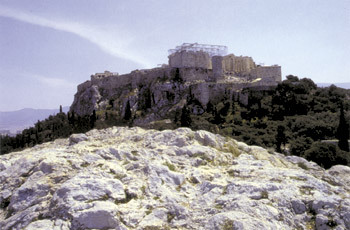 The Areios Pagos (the Hill of Ares or Curses) is situated to the northwest of the Acropolis. The Areopagus hill was the meeting place of the council of ancient Athens that had the same name. Originally it was a council of nobles and then a judiciary body specialized in cases of murder. It was also the place where Paul the Apostle preached in 54 BC, when he visited Athens. To the northeast side of the hill have been discovered the ruins of a post-Byzantine three-aisled basilica dedicated to Saint Dionysius the Areopagite.